Recently, there has been a wave of cities (and companies) making pledges that they are “powered by 100% renewable energy.” Some states are getting in the game, too. Two years ago Hawaii pledged that its electricity would be entirely renewable by 2045. The California Senate recently passed a bill setting the same goal, while moving up the state’s timeline to get half its electricity from renewables from 2030 to 2025. All of Colorado’s Democratic gubernatorial candidates have made a pledge for that state to be “100% renewable” by 2030. Many renewable energy advocates point to the Texas electricity market as a shining example of how these lofty renewable energy goals can become reality. Those same advocates fail to disclose (or maybe even recognize) two fundamental and cautionary truths of the Texas wind energy experiment. First, when Texans’ demand for energy is the greatest, in the heat of the summer days, wind energy nearly disappears from the grid. The result is that the grid depends on the contin- ued reliability of the fuels that have powered the Texas success story—natural gas and coal. The second reality of the Texas grid is that state and federal subsidies for wind energy have eroded the Texas generation fleet of valuable baseload generation assets and the market structure for generation capacity discourages baseload investment. Only after all of the facts are examined can anyone fully understand how the story of wind energy in Texas proves that the “100% renewable” claim is not achievable. Sobering lessons have been learned in Texas about how the distorting effects of renewable subsidies can lay waste to the competitive marketplace and expose ratepayers to high cost and low reliability. The Texas grid’s size, diversity, and electrical isolation (for the 90 percent of the market in ERCOT), create a unique opportunity for the rest of the nation (and the world) to learn from the Texas experiment. To fully understand the cautionary tale of wind in Texas, there are some key background facts about the Texas electricity market that must be understood. As documented by the Dallas Morning News (see Figure 1), Texas generates and consumes more electricity than the next top two power consuming states combined (California and Louisiana). This is not just a function of Texas having a large population with a climate that demands air conditioning several months a year. Half of the power Texas consumes is in the industrial sector, which produces a significant component of America’s fuels, chemicals, and manufactured goods. The diverse, reliable, and affordable Texas grid drives the machinery depended upon for oil and gas exploration and the manufacture of fuels, chemicals, steel, automobiles, beverages, and semiconductors—just to name a few. Our state is a “maker” while many other states are the “takers.” Texas uses more electricity to “make things” than the next three states combined (Louisiana, California, and Pennsylvania). A key part of the Texas economic success story has been the diverse and affordable supply of electricity from natural gas and coal (with steady support from nuclear power). Coal hedges natural gas price volatility and natural gas hedges the regulatory volatility driven by the environmental left’s “war on coal” (which also includes a “war on gas,” by the way). For example, as seen in Figure 2, gas had the largest market share in 2016 (43.7%), as compared to coal (28.8%), while coal recovered the lead in 2017 (36.7%) when natural gas prices increased and its market share decreased (33%). Recent retirements of 4,100 MWs of coal will return the lead to natural gas in 2018, but the Texas coal fleet remains a significant component of the Texas market and remains the nation’s largest coal fleet by a significant margin (see Figure 3). In recent years, Texas has seen an explosion of wind energy development due to the availability of the resource and significant state and federal subsidies. As shown in Figure 4, by the end of next year, Texas may approach 29,000 MWs of installed wind capacity, and Texas already has over three times the installed wind capacity of the next largest wind generating state (Oklahoma). 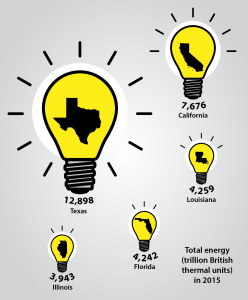 What powers Texas when it needs electricity the most? Is the Texas market retaining or attracting those types of resources? Are these dynamics exposing the Texas market to reliability concerns and price spikes? The first question is easy—what powers the Texas market when it needs it the most? Not wind. There is a big difference in the “installed capacity” of wind and the “deliverability” of reliable electricity, when needed. 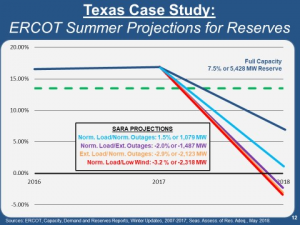 As shown in Figure 5, during the four highest summer and three highest non-summer electricity peaks of the last three years, the vast majority of installed wind capacity was a “no-show” for Texas (the pink part of Figure 5). The wind that did blow was a tiny fraction of the overall power needs of the market (the blue part of the bar chart). As noted already, the dominant players that kept the lights on in Texas were natural gas and coal, with some help from nuclear power (the red part of the bar chart). The second question is more complex but the answer is perhaps the most important lesson. Other states (and nations) can learn from the Texas wind experiment. Despite constant spin from environmentalists and the renewable energy industry that “the market is choosing wind,” wind, through its subsidy-driven negative pricing, is devastating the competitive marketplace for power in Texas. Contrary to repeated claims about wind being at “grid parity” with gas and coal, unsubsidized wind power is more expensive due to the simple fact that it is less energy-dense. Because wind requires much more material and support infra- structure to deliver the same amount of power as gas or coal, it is more capital-inefficient and delivers “less for more.” But this fact is not nearly as bad as the “intermittency problem,” discussed above, and it is why wind is not today, nor will be any time in the near future, cost-competitive with gas and coal without subsidies. 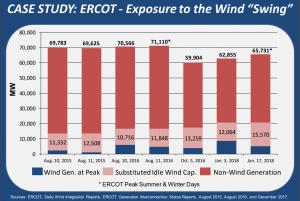 So why then does wind get built and continue to poll well with the general public? The fundamental reason is that the true and total costs of wind energy are hidden from the ratepayer because those costs do not show up in the electricity bill—they are buried in their tax bills. On the federal level, billions of dollars in renewable income tax subsidies in the form of the Wind Production Tax Credit are buried in multitrillion-dollar tax bills spread across all American taxpayers. Similarly, multibillion-dollar local property tax breaks handed out to wind developers are hidden in state and local taxes that necessarily increase for all Texans to cover the costs to the public school financing system from those tax breaks. 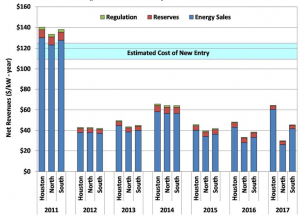 Another cost of wind that is not transparent to ratepayers is the elevated price all Texans pay for the transmission component of their electricity bills. Over $7 billion was spent on Competitive Renewable Energy Zones (CREZ) which involve the building of long distance, high-voltage transmission lines to bring power from where the wind blows (primarily in West Texas) to where the electricity is consumed (primarily in major metro areas in Central/East/Southeast Texas). With none of these significant costs transparent to ratepayers, it is no wonder that wind is perceived as a good deal. In the end, markets cannot function rationally if consumers do not know the true and total cost of what they are buying. As bad as this lack of transparency is to the competitive marketplace, there is another subsidy-driven market distortion that is having a more immediate and devastating impact on the competitive marketplace—and that is negative pricing. 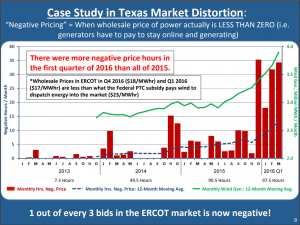 Negative pricing arises from the fact that wind energy is so heavily subsidized that wind generators get paid more per unit of energy in subsidies ($23/MWhr) than electricity can be sold for most of the time in the Texas market ($10-20/MWhr). Because wind generators only get paid the subsidy if they are generating, wind generators will literally pay others to take their electricity right up to the full value of the subsidy, which results in the price of electricity dropping to well below zero—hence the name “negative pricing.” As wind energy has grown in the Texas market, so too has negative pricing (see Figure 6). While some might, at first, view this “negative pricing” as a good deal for Texas consumers, it is a fundamental distortion of the com- petitive marketplace that has proven to have a devastating effect on the types of reliable and resilient generators that Texas cannot afford to lose—gas, coal, and nuclear power plants. These plants either have to sit idle without compen- sation until wind “no-shows,” as discussed above, or, worse, they have to pay to stay online if they want to avoid cycling their plants up and down as the distorted market fluctuates. In addition to eroding the ability of companies, cities, and cooperatives to realize the useful life of existing gas, coal, and nuclear assets, negative pricing and the general price suppression that results from so much “free” energy have sent shockwaves through the investment community and suppressed the construction of new power plants. 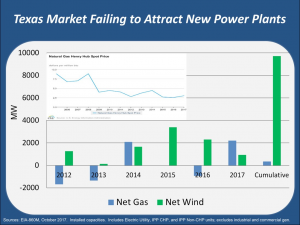 In a state like Texas, which is awash in natural gas and pipelines and has continued to see steady growth in the demand for pow- er, one would have expected the construction of a new fleet of natural gas power plants over the past decade. The reality, however, is somewhat shocking. As shown in Figure 7, despite having enjoyed historically low natural gas prices for nearly a decade, the net addition of new gas-fired capacity is a paltry 200 MWs during the last six years while the new demand for electricity was largely gobbled up by subsidized windmills—which now top 20,000 MWs of installed capacity. The ERCOT Independent Market Monitor (IMM) recently documented just how uneconomic new gas-fired generation is in the current distorted market dynamics (see Figures 8-9). Tragically, if natural gas prices trend upward as predicted, we may all look back at this timeframe as a lost opportunity to build new, highly efficient gas-fired generation that will meet baseload demands and not simply small, less-efficient peaker plants (used to provide electricity for the market during times of peak demand) for short-term opportunistic market opportunities. 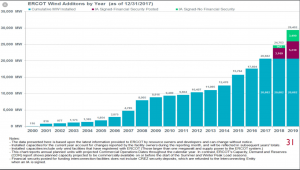 Because we have allowed the true and total cost of wind to be hidden from consumers, we have stripped the transparency from the once-idealized, and now distorted, ERCOT market. As compelling as are the answers to the first two questions, the third question is the one haunting Texas officials and residents heading into the next two summers. 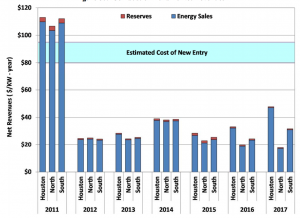 As recently documented by ERCOT in its May Seasonal Assessment of Resource Adequacy (SARA), the long-stable reserve mar- gin in the Texas market has dropped into single digits with several modeled scenarios approaching or even dropping below zero, which will likely mean increased price volatility (all the way up to the $9,000/MWhr cap), and possible rolling outages and brownouts (see Figure 10). 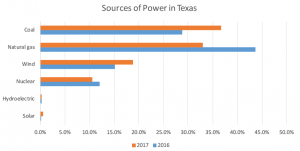 Given the intermittency, transparency, and reliability problems discussed above that have resulted from the subsidy-driven wave of wind power in Texas, it should be clear to other states (and nations) that the tale of wind power in Texas is a cautionary one which, if repeated, could devastate a less resilient grid. 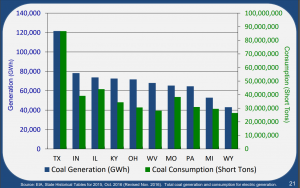 Market managers and designers should learn from the Texas experiment but not for one second believe the spin that it proves the viability of a “100% renewable” world or the advisability of racing toward such a goal. It is highly likely that Texas officials will be working to mitigate the market distortions that are now evident in the once-idealized Texas competitive market. Unfortunately, much of the damage has already been done and the influence of federal policy decisions will be hard to overcome, so the road back to a truly competitive marketplace could be rough and slow. Hopefully, a healthy adjustment of state and federal policies will balance the playing field, restore transparency, and guide the way for other states and nations to restore sane energy policy for years to come. Electric power is today, and has always been, “for the public good.” Market distortions and commodity trading approaches may provide an illusion of progress in the short term, but the reliable, resilient supply of electricity and full transparency of cost to consumers will be essential to ensuring that the “public good” is achieved.